Archie has a few issues to sort out upon his arrival back home. For one thing, he missed a whole lot of school while in prison and on the run with the consequence that his poor timing gets him back just in time for the SATs. Archie refuses Principal Weatherbee’s suggestion that he repeat his junior year opting instead to cram studying in a short amount of time, helped out by Betty. The studying isn’t going well for Archie, especially in his room that’s full of distracting clutter, ie: trophies and awards. In addition to getting his room and school life back on track, he’s got Veronica back on his arm, but things just aren’t’ the same between them. She’s having a hard time letting go of the fact that he ran out on her and we also can’t forget that her father, Hiram, is still after Archie. It’s a lot for a teenager to sort through and, in the end, Archie ends up running out on his SATs and sets up a hanging punching bag in his room. It looks a bit like his old cell but he definitely seems happier than before. We’re just going to pretend he didn’t take a sip of some alcohol before starting his workout. Betty’s contentious relationship with her mother reaches new heights when she discovers that Alice gave away all of her college savings to the Farm. Alice hides behind the “donation” moniker and says it’s to “cover the cost” of all the children Betty liberated from Sisters of Quiet Mercy. How kind of you, Alice. Of course, Betty wants to pursue legal action and seeing as how her mother forged her father’s signature on the document, Betty needs to visit her father – aka The Black Hood – and have him declare that he did not give Alice permission to give away Betty’s money. Betty’s visit with Hal results in him agreeing to sign the required form, but he wants to see the manual to Gryphons & Gargoyles. It’s a strange request but he thinks he can figure out who the Gargoyle King is because he was the original one. Hal lets it slip that he was at ascension night and poisoned the chalices because they were all sinners. Betty does some investigating and realizes everything he said was a lie: he was never there. When Hal signs the form he admits that he lied in order to keep her coming back to see him. 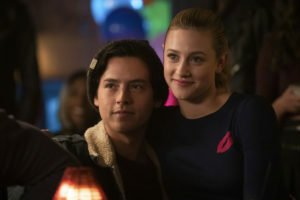 In the end, Betty does visit him again of her own volition to complain about her mother, the Farm, and the lack of financial backing that she’ll have for college. Although Hal is a serial killer, he’s still Betty’s father and gives her some great advice and comfort, telling her that schools will be lining up to offer her a scholarship and things will work out. Fangs Fogarty’s undercover work as a Gargoyle finally paid off. After having such great Fizzle Rocks sales, Fangs has been invited to join the inner circle of the Gargoyle gang. 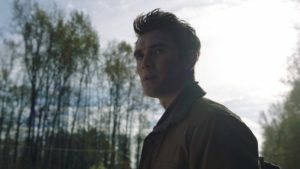 It’s the moment that Jughead has been waiting for because it means Fangs will come face to face with the Gargoyle King. 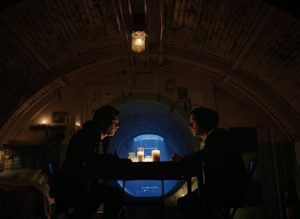 Jughead assures Fangs that the Serpents will be there and have his back. It’s a good thing the Serpents were there: they managed to catch the Gargoyle King and prevent Fangs from getting branded. As it transpires, the Gargoyle King who has been roaming around and scaring people is Tallboy, the ex-Serpent whom everyone assumed was dead. A quick chat with Tallboy reveals nothing linking back to Hiram, so the only way to get him is with bait in the form of Archie. The meet is set up and what looks like the most promising thing to finally getting Hiram turns into disappointment when the Man in Black who shows up is actually Claudius. Thankfully, FP was there as the Gargoyle King and he made a citizen arrest of Claudius. At least that’s one peg knocked out in Hiram’s group. Speaking of Hiram Lodge, he seems to be sitting on top of the world. With his wife as mayor and his drug empire running strong, it seems no harm can befall him. Hiram wants to move the family to the Sisters of Quiet Mercy convent, which is up for sale, and he also wants Hermione to appoint Claudius to be the new sheriff. Hermione is on board with the move so long as the place is cleansed of dead nuns, but she struggles with Claudius as the new sheriff. Hiram makes a thinly veiled threat to her life in order to ensure that his will will be done, as it’s what’s best for both of them but – fortunately – Claudius was arrested before Hermione had to deal with him. In fact, Hiram was on the phone with Hermione telling her not to worry about Claudius and bragging about being one step ahead when Hiram was shot! We don’t know who shot him but Hiram is in the ICU. 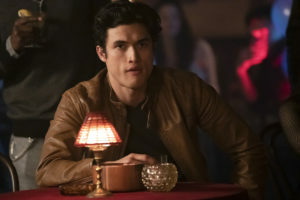 As a result, several things happen: Veronica suspects Archie and they subsequently break up as she can’t believe he wasn’t somehow involved, Hermione meets with Jughead’s father, FP Jones and says “it’s time” which results in FP becoming the new sheriff of Riverdale, and – of course – Claudius dies in prison. Veronica held a little party for Archie at her speakeasy but Archie ended up having some flashbacks and ran out. Reggie was not impressed and confronted Archie about it later. Archie asked Reggie about cheating. Reggie took it to mean cheating on Veronica while Archie was talking about the SATs. Needless to say, the secret is out. Since Archie and Veronica broke up, Reggie and Veronica are officially a thing. Penelope Blossom has been posing as Alice Cooper in order to have conjugal visits with Hal. She’s also where Hal got his info about ascension night. Tallboy is dead. It was an accident involving Fangs and Sweet Pea, but at least he’s no longer a threat. Speaking of Fangs, he was officially welcomed back as a Serpent for his undercover work. Thanks to Betty’s “donation” the Farm was able to buy the Sisters of Quiet Mercy convent and they now have a permanent home in Riverdale. Eww. Thanks to Edgar Evernever’s connections, Alice got a job as tv broadcaster. She’s dressed more like her old self and it’s odd.